If you have had the misfortune of being hassled while travelling by bus, SkyTrain, or SeaBus, we would like to know! While we acknowledge that harassment can take many forms, we are specifically looking for experiences where you have been targeted primarily in a way related to sexuality or gender, and we are interested in compounding factors like race, class, or ability. This could range anywhere from a clueless would-be Lothario who can’t take headphones and a book as a sign of disinterest, to serious threats on your person. We believe all of your stories are worth telling, and we welcome all the details you wish to share. We would appreciate your age and gender identity for the purpose of data analysis, but this is not at all required. Unless you specify otherwise, your submission will be posted without your name. There is a saying. This saying essentially discusses how the world should be and how the world is. You are of the former. If you present yourself to the world as an apparent lesbian or an ‘abnormal’, the world will react in turn. Your situation was unique since what you experienced happens sporadically and rarely, if at all. But, it does happen and there are circumstances. As I wrote previous, most (99.9%) people take note or not for a moment and move on just as they do with all spectacles. Thus, your problem is that you are presented to the world as a spectacle. Maybe if you didn’t try so hard to look different, you’d not have these issues…or, you would on all rare occasions. I was so looking forward to the first comment that accused me of angry lesbianism. As if either of those things aren’t a legitimate state of being, or are somehow worthy of ridicule. You seem to be suggesting that harassment is acceptable under certain circumstances. I think that the majority of us choose to live in Canada because we are guaranteed freedom of speech WITHOUT being subject to harassment and mistreatment; i.e. the right to look how we choose without being targeted for it. Are you suggesting that men are so barbaric that they cannot actually resist harassing a woman who looks a certain way, and that it is the responsibility of women to behave in a manner that doesn’t tempt men to revert to some natural tendency to marginalize and bully women? to jmviani on “being different”. My masters research at UVic showed that homophobia is maintained by occasional comments like this, which target anyone who seems different than the gender norm, whatever the norm is to you. This includes discrimination against straight men who are more “feminine” and straight women who are more “masculine.” A small minority who express anger and violence makes it seem as though the whole atmosphere is hostile. This is what keeps everyone nervous and what makes kind people advise their glbttq friends to stay in the closet. The best antidote (the research showed) is to be out and proud of who you are. This helps your friends and allies (coworkers, family members, and the public) to come forward and support you. You see, and it is funny, it is in our great country and other G8 type countries that allow this sort of expression as you sport. You are allowed to be as you are, even if it be, as in your case, derivative. You get to take Woman’s Studies and be a lesbian and write your thing all because our western world not only allows it but encourages it. Hey jmviani, I have some statements and then a question for you. I see that you are using the internet, I hope that you have enjoyed your time on the Internet. It is one of those post-modern tools we enjoy as a collective. -There are no such things as “countries”. History/Geography/Science shows that “countries” do not exist. -People express themselves in every single moment, irrespective of clothing/material goods/or permission. We express ourselves forever even when after we die or are killed. I don’t know if anybody told you yet but clearly it is harder to be a women than a man in public, on any land mass where a public resides (what you call countries). The delusion of the privileged white male (or the wannabe privileged white male) is that this is due to the inherent faults of women who complain. I think the point you are expressing is essentially “quit whining, you asked for it” which is also something my own father told me. Jmviani, your father/patriarch/main voice of authority was wrong. Times are a changin. Defacing knowledge and using your words to try and silence people is one of those pass-times only old people appreciate, and boy do we pity them for it. But perhaps you have more incite/knowledge that I am unaware of. Would you speak up if someone was attacking another person on the bus, or would you rather remain in your seat? Perhaps you drive a car. So you had one bad day on public transit, big deal! How many days on public transit were you just fine? Nobody is trying to take the bad day championship away from you jmviani. Why are you on the defensive? We’re working on it. We have a backlog of nearly 100 posts, and still trying to cope with media requests on top of things. We’re both students with jobs and can only go so quickly, and I say that as someone who has only had about 3 hours of sleep a night for the last week. We beg your patience. Great site..at least talking about it collectively is healing! 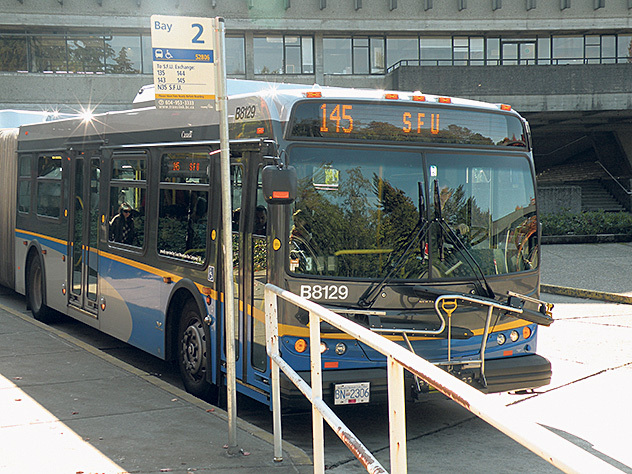 I’m a story teller by trade and by birthright, and I’ve been harassed on transit lots. I want to thank you for providing this service. Without it, I might never have realised that the harassments I’ve endured actually constitute stories. I mean, obviously I’ve told a few of them but I never thought of them as harassment stories until now. So, thank you. I’ve been harassed by girls numerous times. Once at broadway stn by a group of underage very drunk girls who sat on my lap and asked if I was ‘their daddy’, when I rejected their advances they threatened to call some thugs… another time a wasted crackhead grabbed my junk while I was standing by the doors waiting for my Renfrew stop while asking for money… was once with a girl when a group of other girls made sexual comments about what she was wearing which escalated and they called thugs. I had a gay guy make comments on the Davie bus, I’ve dealt with countless wasted hobos, and a nut swinging a chain on the skytrain.